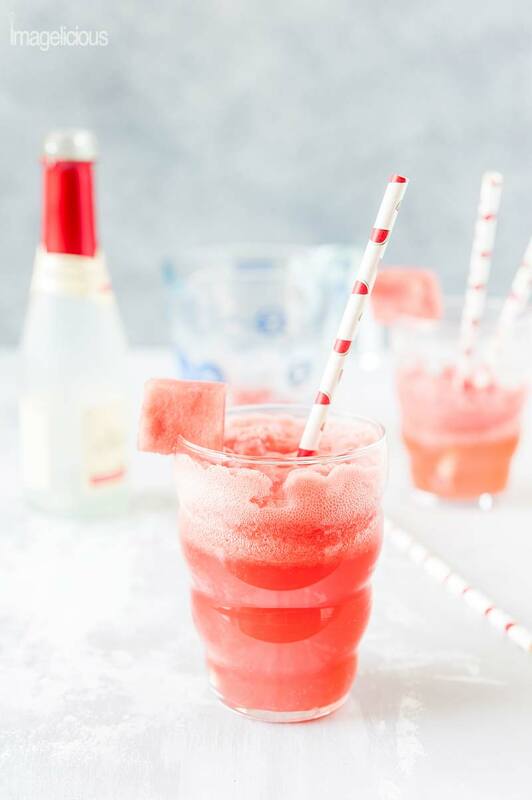 Refreshing Watermelon Mimosa is a perfect summer cocktail made with fresh sweet watermelon juice and sparkling wine (alcoholic or non-alcoholic). It’s great to sip on a patio or have for brunch. This post contains amazon affiliate links which means if you buy something after clicking one of those links, I will receive a small commission. I recently learned a cool new way of cutting a watermelon. Instead of the usual wedges, I now cut the rind off the watermelon first, almost like if you were to do it to a grapefruit, and then when it’s just the sweet red flesh that is left I cut it easily into chunks. It’s super convenient, takes no time, and I don’t know why I’ve never done this before. Now that I learned this new trick, it’s easy to enjoy the watermelon. I used to hate all the mess that came with eating it. I usually chop it into chunks and keep in airtight containers in the fridge which makes eating it and cooking with it really convenient. Watermelon, like many other foods, reminds of my childhood. I remember biting into the first watermelon of the season when I was little. Sugary juices running down my chin, my arms and tickling me. Sticky fingers. Sticky ears. Smiles. Such innocent joy in every bite. I remember, as I was cutting the fruit I gave my one-year-old daughter her first bite of the watermelon. She protested at first like she always does when something new is presented to her. She cried and shook her head. Then she stopped and licked her lips. She paused and she opened her mouth. She smiled and kept asking for more. I’m sure she won’t remember that first taste of the red-coloured fruit but hopefully in a few more years I’ll give her a ripe watermelon wedge and she’ll bite into it getting her whole face dirty; she’ll then laugh when the watermelon juices will trickle down her chin leaving red sticky marks on her hands and her memories. 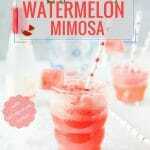 This Watermelon Mimosa is really easy to make and is delicious during summer months. Non-alcoholic mocktail: use non-alcoholic sparkling wine and pomegranate juice. 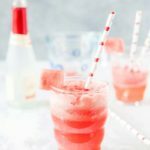 Alcoholic cocktail: use your favourite sparkling wine and campari. Both campari or pomegranate juice are optional but they add a nice refreshing note to the Watermelon Mimosa. I like campari for a slightly bitter taste that works really well with the sweetness of the watermelon. And if you like sweet and bitter tastes together then try my Sparkling Campari Orange cocktail. 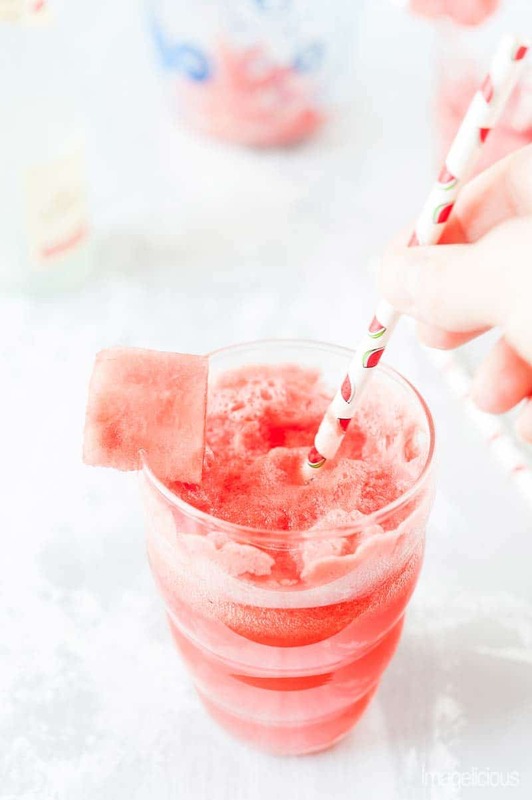 Making Watermelon Mimosa is really easy, just blend watermelon chunks using a regular or a hand blender, add campari/pomegranate if using and top with the sparkling wine. Watch it foam and bubble! It’s really pretty! I’ve been using my hand blender/hand food processor for about a decade and it’s still working great! It’s one of my most used appliances. 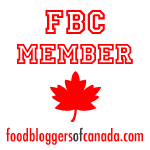 In fact, I use it much more than my regular size food processor. 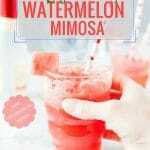 Watch this video to see how EASY it is to make this delicious and refreshing watermelon mimosa! Using a regular blender or a hand blender blend the watermelon chunks until they become smooth. You can strain the resulting watermelon but I prefer to keep it a bit thick. Add Campari or pomegranate juice. Pour the mixture into two glasses and top with sparkling wine (alcoholic or non-alcoholic). It's better if both watermelon and sparkling wine are chilled. 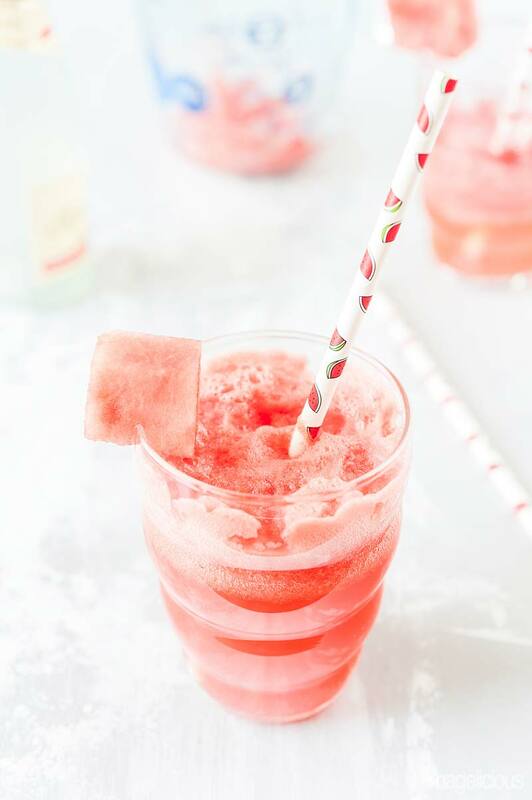 Love this, watermelon is the most refreshing thing to enjoy in summer, so in mimosa form it would be just lovely. Definitely trying your tip for cutting on my next watermelon!! Watermelon is my favorite. My family basically becomes 80% watermelon when its in season. We can’t get enough. I can see me making these for summer brunch a lot. I started doing the chunk style cut a while back too and it changed my life. Definitely way less messy than the wedge style. Oh my goodness, not only does this sound delicious, it looks beautiful too! Thank you for sharing the non-alcoholic version! Can’t wait to try it! 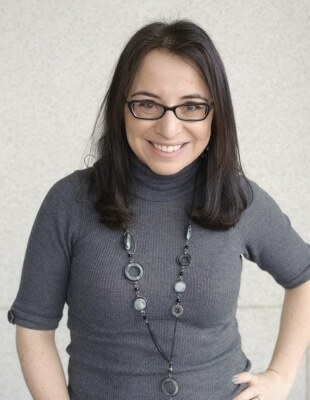 I always like watching a kids first bites of juicy watermelon because the resulting grin is always so sweet and exciting. Cutting the rind off of watermelon is the way to go! It definitely makes it so much easier to eat. The only problem is that it disappears in a flash! 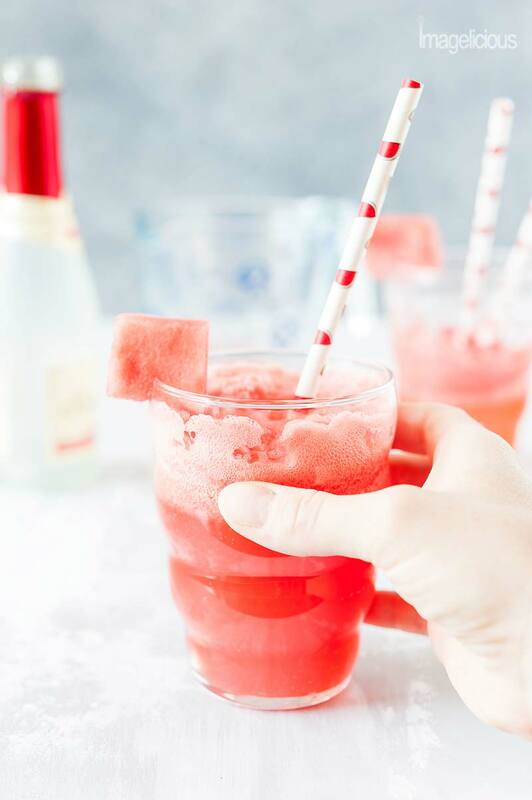 This simple cocktail is so perfectly refreshing for hot summer days! Wait- you cut the peel off the watermelon first?! Omg! Why have I never thought of that??? I’m totally trying that- and then I need to go find some Campari! Delicious! Watermelon is so good on its own, but I love doing things like this with it. Love the touch of campari to balance the sweetness and brightness of the cocktail too. Oh and your comment about offering some to your daughter made me laugh. I wish I had a dollar for every time one of my kids had decided (in advance) to dislike a new food only to be surprised by the taste of it. Ahh, kids. Haha. This was a favorite at the girls night I had last night! We had to go get more watermelon because everyone liked them so much we all wanted seconds and thirds! I’ll definitely be making htis again! This drink definitely screams summer and refreshing! Using watermelon is such a great and delicious idea. I will be sipping some of these this weekend. Thanks for the recipe! Love, love LOVE the photos for this! Pink and frosty–who wouldn’t want one of these on a hot day! Watermelon is synonymous with summer for me. I LOVE watermelon. In fact I have 2 containers of cut watermelon in the fridge right now. This is such a great way to make a delicious drink (either version). 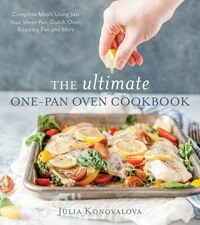 With the warm weather getting here (eventually) this is perfect for outdoor entertaining. These are so pretty and I’d be happy sipping on them all day long! I always make a watermelon puree when I have parties with a mimosa bar, but I love that there’s Campari in this one, too! This recipe is so perfect to sip on hot summer days. I am going to try it for sure. Keep posting such lovely content.